Yes...yes, I'm afraid I have been quoted out of context. No, no...I never met him. I knew him only by reputation. No...yes, that's right, the four fifteen flight. Direct. Oh dear...could I please speak to the manager. What do you mean, no-one is in charge? Someone must be in charge....? So, here we are on the internet, waiting for good books and the afterlife. I think I have been here before, sitting at a computer, trying not to face sleep. I fear I have been misquoted. I fear that I may never leave this room, or have never left it. I was born here, tied to the computer, picking scabs and eyeing the alarm clock. Parlez-vous Francais? Habla Usted Espanol? Someone here must know what is going on. 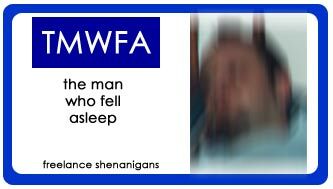 Themanwhofellasleep? No...never heard of him? What? Is this some kind of joke?